On Sunday, fathers around the country will be on the spotlight as they receive the customary gifts and special attentions for Father’s Day. However, only those who spend it at Hernán Gipponi will have the chance of enjoying the decadent Father`s Day brunch that has been organized for the occasion. The menu, which features delicacies such as prawns with grilled polenta, greens & black olives vinaigrette and tempura kingfish with citrus cream & akusay, is fit for a king, and comes with a special present by Rutini wines. Book your place at Hernán Gipponi Restaurant: 3220 6820, info@hgrestaurant.com.ar. Fierro Hotel Buenos Aires, Soler 5862, Palermo. 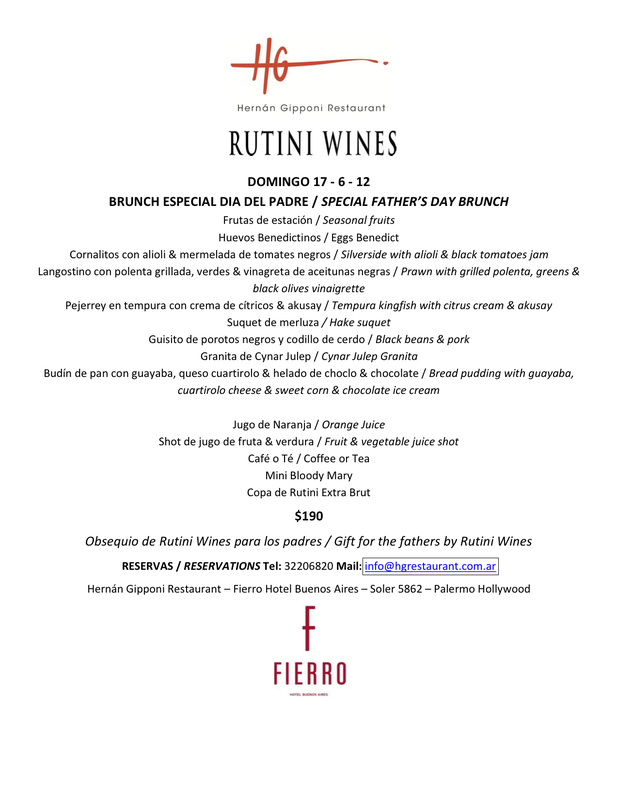 This entry was posted in Argentine Culture, Buenos Aires Agenda and tagged argentina, Brunch, buenos aires,, Father's day, fierro hotel, hernan gipponi restaurant, Hotel, Palermo, restaurants by Fierro Hotel Staff. Bookmark the permalink.